Well made video describes the conjugation and use of the verb "to be." Includes contracted forms and affirmative/negative use. 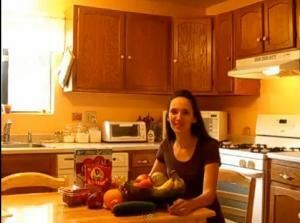 Native speech sample offers frequent discussion of food-related vocabulary. This game is based on the TV show "Who Wants to be a Millionaire?". 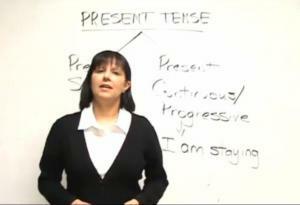 The questions focus on the present tense (simple and continuous). 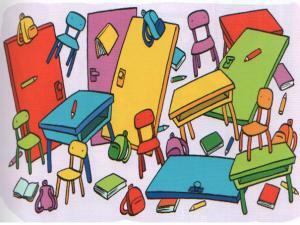 Test your knowledge about verbs and win the big prize! You can choose to play alone or compete with a friend. 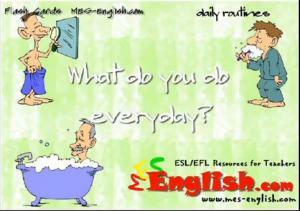 Grammar lesson for the simple present to express actions we do everyday in affirmative, negative and interrogative. The lesson teaches when to use do/does and don't/doesn't. Explanation of how to conjugate verbs in the simple present within affirmative sentences. Very good exercises included. Timed grammar game about verbs. Listen and select the right verb. 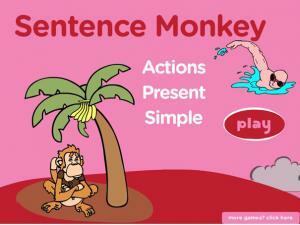 Practice the auxiliary (of 'helping' verb) 'to be' in the present simple tense with this fun interactive game. Read the sentence and click and drag the correct part of the verb from above to complete the phrase. We use the present simple to talk about things that we do often. 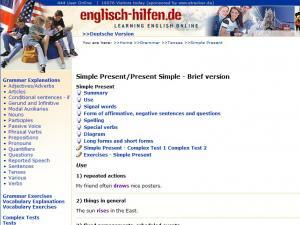 This site gives examples of using the present simple in this way. 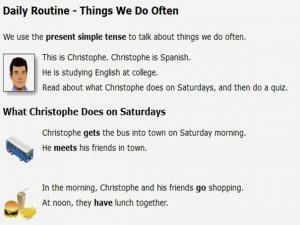 Read about what Christopher does on Saturdays, and then do the quiz to check your understanding of this verb form. There is or There are? Look at the pictures and fill in the blanks with 'is' or 'are'. There are 4 sentences per picture. Once you have finished submit your answers and see what score you get! You can click Show Answers to see where you went wrong. 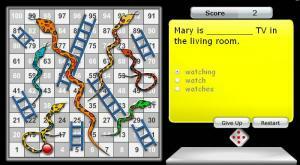 Snakes and Ladders Game: Present Simple or Present Progressive? 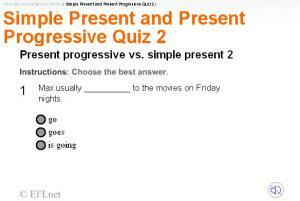 You've learned the simple present and the present progressive, but which to use when? 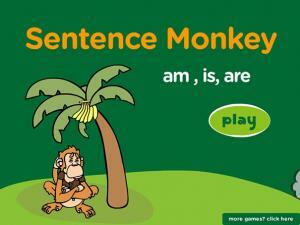 This game helps you practice these two tenses in different sentences. Each time you get an answer right you get to roll the die. Move up ladders, but you'll fall back if you land on a snake! Do you want to practise using the present simple of the verb 'to be' in English? Play this present simple game and have fun while you learn. There are two games for you to play. Read the question. What is the best answer - A, B or C? Click on the answer that you think is the best! Then click 'next' for the next question. 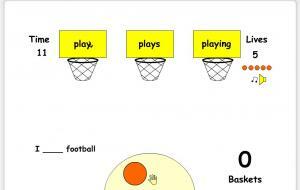 When you have played the games you can print off the worksheet and practise some more. This is a fun way to check your understanding of Am, Is, and Are (Present Simple Tense). Read the question, then select your answer by clicking or typing 1,2, or 3. At the end of the quiz you will get a full score sheet to see all the answers you got right and also the answers you got wrong. You are shown the correct answer to learn for next time. Learn verbs and the Simple Present Tense for expressing common daily activities in this set of video flashcards. We use the present simple to talk about repeated actions or events, permanent states or things which are always true. Use this British Council site to find out more about the present simple, read and listen to the conversation below. There are 6 games on this great site, all helping you learn and revise the correct use of 'there is' and 'there are' when talking about individual or plural nouns. Look at 2 pictures and decide how many of the statements are correct, read the passages and move the monsters and objects into the correct place, listen to the song and put the sentences in the right order and, finally, create your own classroom and write a few sentences to describe what is going on! 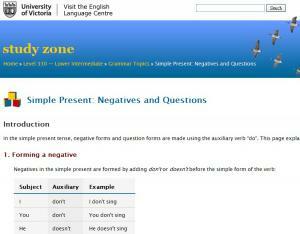 Explanation of how to conjugate verbs in the simple present within negative and question sentences. Very good exercises included. 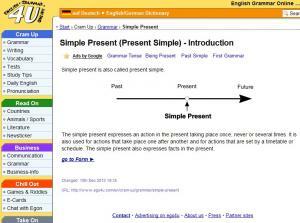 Explanation of when to use the simple present or present continuous. Very good exercises included. 4 practice exercises for you to try. 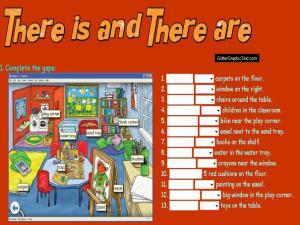 Look at the picture and fill in the gaps to make the sentences complete and correct. Correct the errors by re-writing the sentences in the boxes. Look at the map and add in some/a//an/any to make the statement true. Finally, choose the correct phrase from the drop-down box to form a complete, grammatically correct sentence. Accurate, but very basic, summary of the present tense. Includes uses, a list of signal words, affirmative/negative forms and a link to a practice exercise. 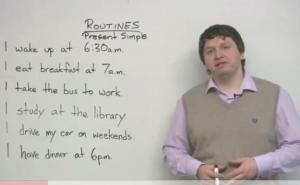 Learn about the present simple tense and how to speak about your daily routine. An excellent lesson for beginners who want to gain confidence in their speaking abilities. You will learn to talk about your everyday activities. 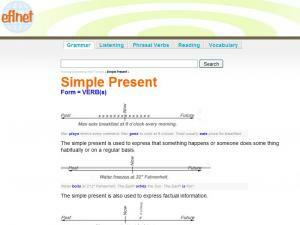 A tutorial on simple present tense, with a detailed time diagram. 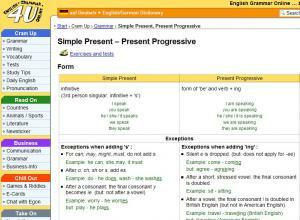 Learn about the difference between the Present Simple and the Present Progressive in English. This video will show you which to use in different settings. 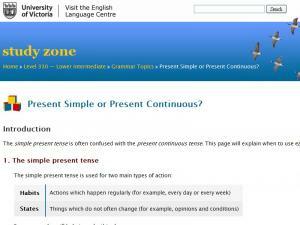 When do you use the simple present tense and when do you use present continuous tense? This list of reasons and examples is thorough. There's also a self-correcting quiz for you to practice! 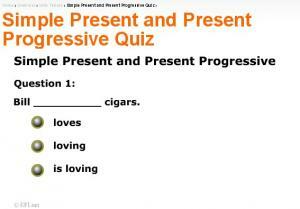 Beginner students are often confused by simple present and present progressive. 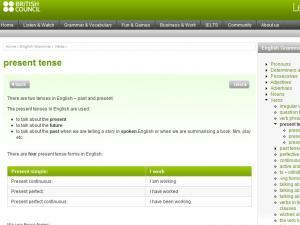 This lesson teaches the differences between the two tenses. 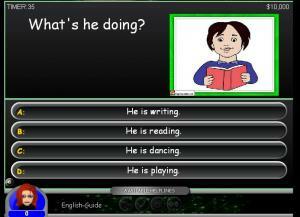 The lesson offers spelling exceptions, 12 exercises and exams for 3 levels. 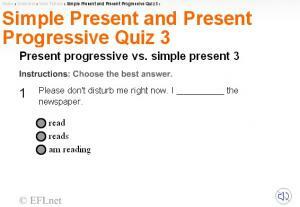 It is an exercise on simple present and present progressive tenses. Essential for beginners. This lesson teaches the simple present, spelling exceptions, how to use "do" and "does" for making questions and negative information and modals can, may, must. Many exercises help you practice this important tense. 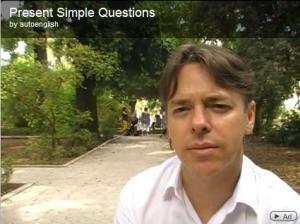 This video class explains how to make questions in the present simple with interactive oral exercises. After watching the video and reviewing the included grammar notes you can complete the printable and online exercises! You can even check your answers. Read the sentence and try to work out the correct word in the Present Simple Tense to complete the phrase. You have a keyboard at the bottom to click on the letters you think you need. You get 6 tries before you see the hangman. Get it right and move on to the next word! 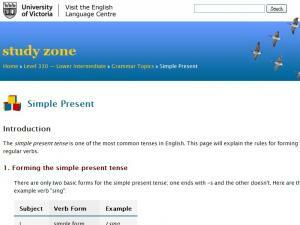 Comprehensive resource for learning and practicing the present tense including stative verbs, narration and adverbs related to the present. 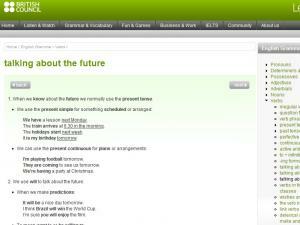 Explanation of how to speak of the future using present tense verbs. Also discusses "used to" and "going to". Includes an exercise. 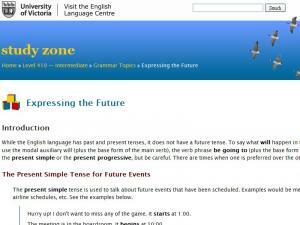 Perhaps you already know the present tense form of regular verbs in English, but did you know that the present tense can be used to talk about the present, past and future? Learn the contexts in which you can do this and play the game to learn more! 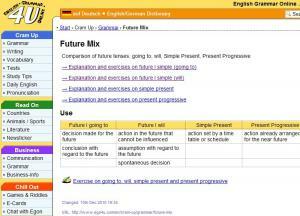 A table to show four ways to express the future tenses in English. There are several exercises for you to practice any and all of these forms in positive, negative and question sentences. The exercises will tell you if you get the answers right or wrong and the correction you need to make. 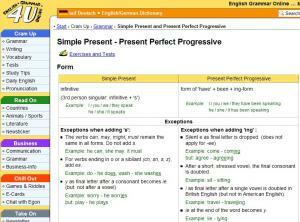 What is the difference between the simple present and present perfect progressive? Learn the structures of each and how to use them. 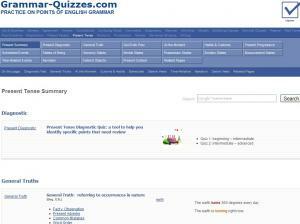 The lesson offers examples, exercises and exams to test your knowledge. Verbs in time clauses and conditional clauses follow the same patterns as in other clauses with a few exceptions….. You'll want to know these exceptions, which are listed here with several examples. 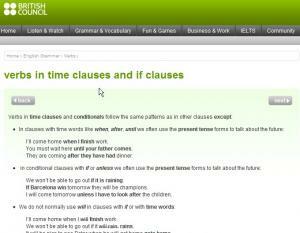 Check out this informative page and take the self-checking quiz about verbs in time / if clauses. There are several ways to talk about the future and this list of reasons and examples goes through them all: using present tense, "will," "going to," modals and other verbs. There's also a self-correcting quiz for you to practice!